WOW - scary night for folks along the Sauk River near St. Cloud. An ice jam caused a significant rise in river levels, which ultimately led to an evacuation for folks eating dinner at Anton's in Waite Park. "Roughly 44 people were rescued from Anton's Restaurant Saturday night. Co-owner Betzy Gaetz says about 7:30 p.m. the water started coming in without warning and by 8:00 p.m. there was about a foot of water inside. There was a private party in the upstairs section. One party goer tells KNSI they were given the choice to stay initially, and then management made the decision to get everyone out. Waite Park, St. Joseph and St. Cloud fire teams used their ice and water rescue equipment to remove people from the restaurant. Rescuers brought boats up to the door and ferried people out of the building. Waite Park Fire Chief Jim Aleshire says he believes an ice jam on the Sauk River is to blame. He says the ice jam was broken up by 10 minutes after 9, and the water had already receded a bit. Gaetz says the restaurant will be closed for at least a week, if not longer. She says the last time the restaurant flooded was ten years ago and they were closed for ten days." River levels across the Twin Cities metro are rising quickly and will likely be in the major flood stage as we head through the week. Here are the river forecasts through April 6th, which suggest that many gauges will be dealing with moderate and major flooding over the next couple of weeks. 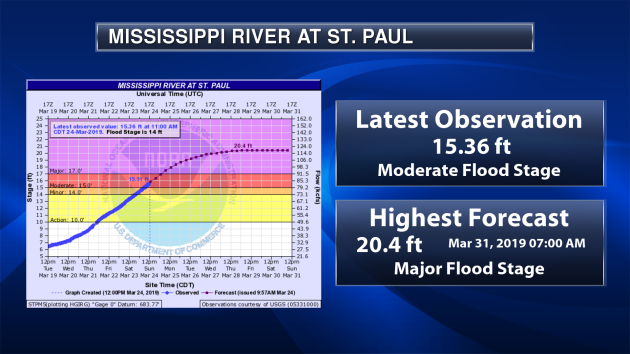 Here is the latest river gauge (and forecast) for the Mississippi River at St. Paul. Note that as of Sunday, river levels were at moderate flood statge and rising quickly! Major flood stage is expected by Monday with levels cresting to more than 20ft mid/late week and into the weekend ahead! Mississippi River at St. Paul - Top 8 Crest on Record This Year? 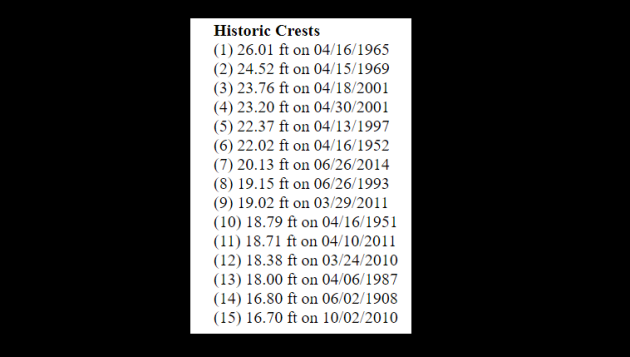 Take a look at some of the highest crests ever recorded along the Mississippi River at St. Paul. Note that the highest crest was back in 1965, when the river gauge recorded a height of 26.01 ft. The most recent high crest was back in 2014 when the river gauge recorded 20.13 ft. The latest river forecasts for this gauge suggests that we could top 18ft. (major flooding) by the middle part of next week, which could put this in the top 8 crests on record! Also, if we get any heavy rains withing the next couple of weeks, this could certainly push river levels even higher! 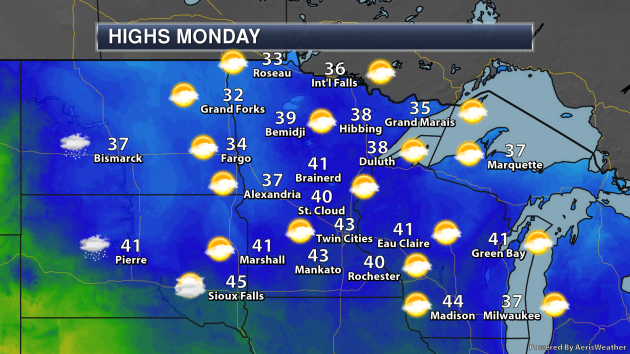 Temps on Monday will be a little cooler across the region with highs only warming into the 30s and 40s. 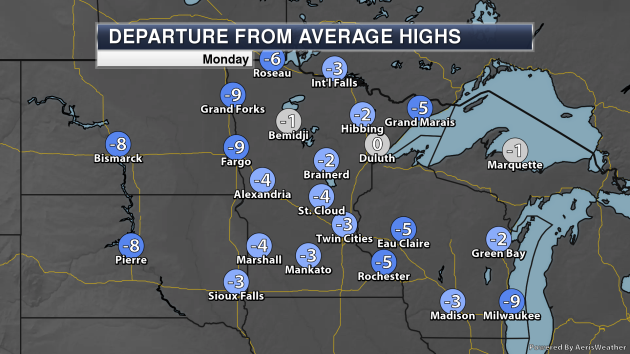 Note that these readings will be nearly -5F below average. According to the GEFS and ECMWF Ensemble models, temps will be a little cooler at the beginning of the week. However, it looks like Wednesday could be pretty warm with highs potentially in the 60s. Models aren't quite sure what they want to do for next weekend, but according to the ECMWF, Saturday could be quite chilly with temps only warming into the 30s. According to the MN DNR, we have yet to see any lakes free of winter ice. Interestingly last year, the ice was already of some of the metro lakes, including Lake Calhoun and Lake Harriet, which went out on March 7th and was the earliest ice outs recorded for those 2 lakes! Not only has it been a wet start to March, but it's been a wet start to 2019 as well. 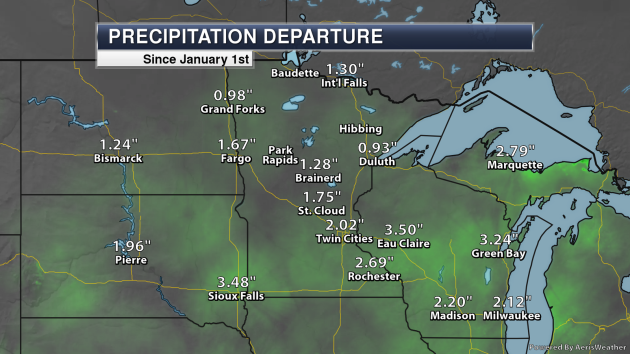 Note that some locations in the southern half of the state have seen more than 5" of liquid, including the Twin Cities! With that said, most locations are nearly 1" to 2" above average for the year thus far, with some in southern MN more than 3" above average. 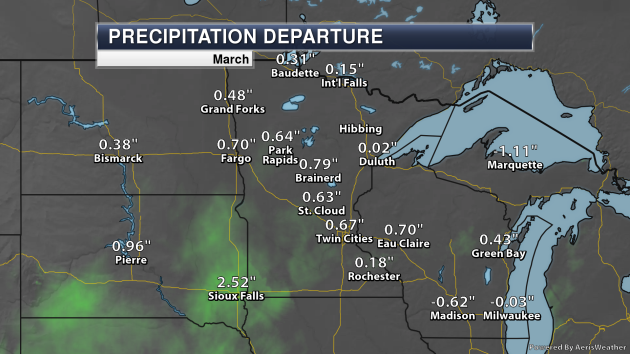 Sioux Falls, SD on the other hand is nearly 3.5" above average! Here's the latest snow depth from across the region. 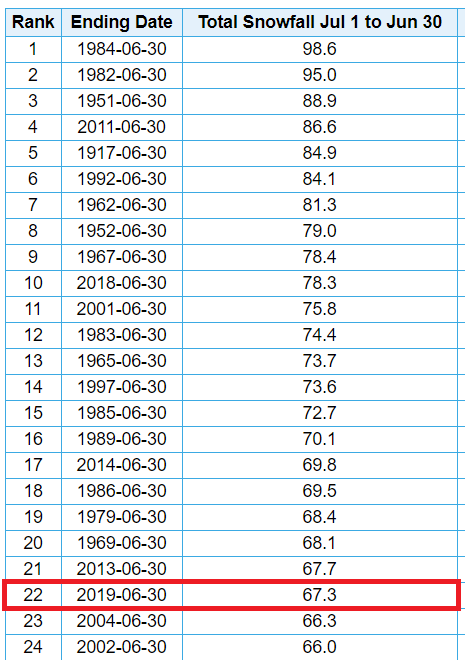 Keep in mind that on Sunday, March 10th, the Twin Cities still had 19" of snow on the ground and nearly 2 weeks later, that number has dwindled to just a trace! 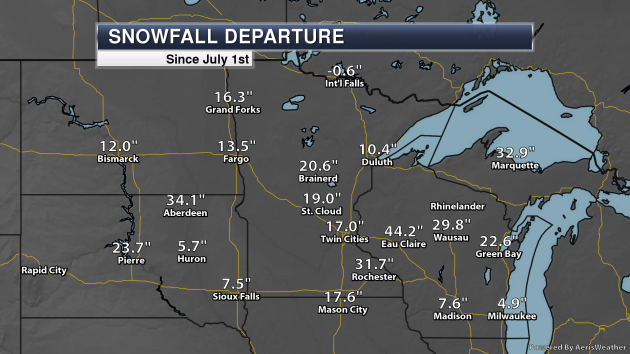 However, folks in parts of northern Minnesota still have nearly 1 to 1.5 feet of snow on the ground! There is still going to be a lot of snow melt, which will help to create more river flooding across the state. 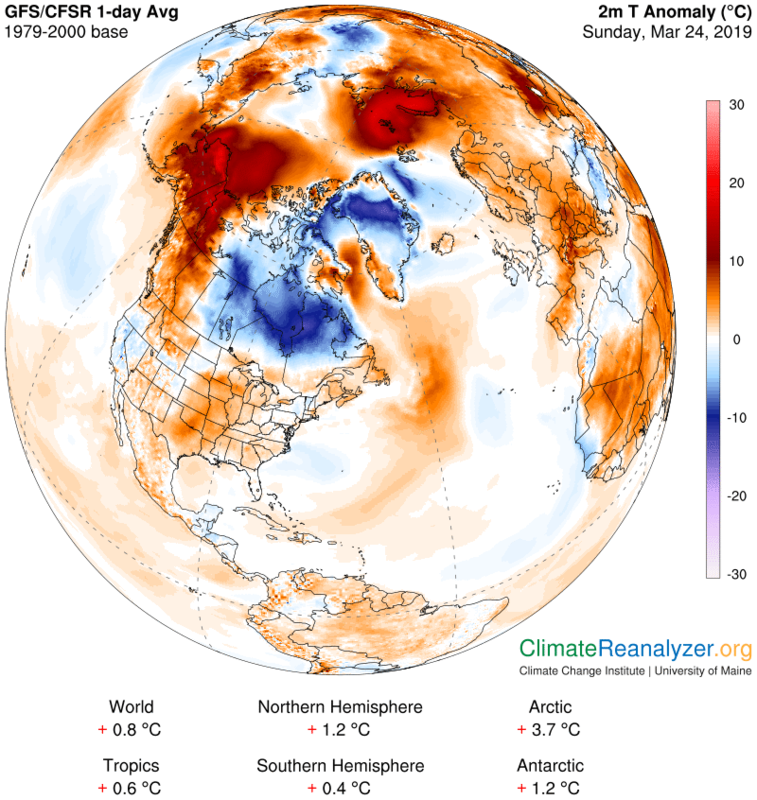 Here's a look at the temperature anomaly aross North America on Sunday, which showed mostly warmer than average conditions across the the Lower 48. However, note how warm it was in Alaska! Here's the temperature anomaly as we head through the first half of the week. Note that temps may be a little cooler to start on Monday, but we're going to have some significant warming by Wednesday. In fact, temps will likely get into the 60s across much of the southern half of the state and there's a potential that a few low 70s could pop up as well! According to NOAA's CPC, the temperature outlook from April 1st - 7th suggests cooler than average temps lingering across parts of the Central US. 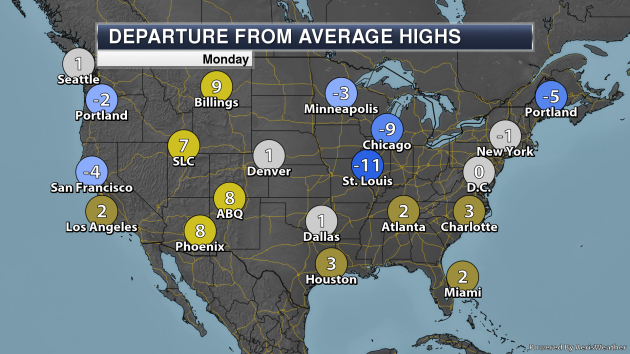 However, it'll be warmer than average along the East Coast and the West Coast. I have it on good authority that when the mercury reaches 60 degrees, some residents of Miami Beach don their furs. Folks in Scottsdale turn on heated car seats. 60F in L.A. requires a sturdy windbreaker. When the temperature hits 60F in Minnesota - in March - the party moves outside. Grilling, while decked out in shorts and sunglasses? Yes please. Such will be the case Wednesday, as the mercury tops 60 for the first time since October 22, 2018. MSP International has lost 19 inches of snow cover in a little less than 2 weeks, but there are piles of snow in the suburbs that may still be there in May. Expect blue sky today, with a mercifully-dry week. 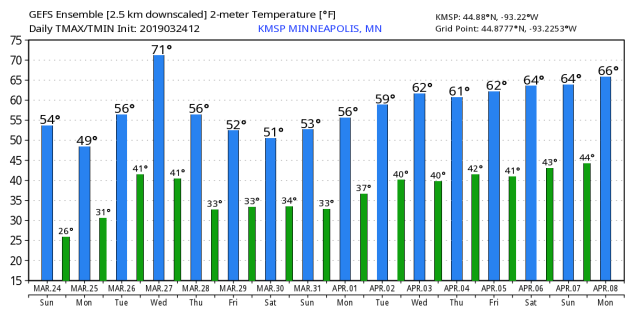 After peaking above 60F Wednesday, temperatures hold near 50F for Thursday's Twins Home Opener, still a far cry better than a first-pitch temperature of 38F last year. 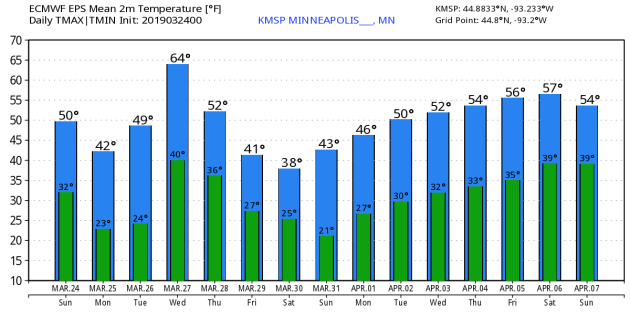 ECMWF keeps the heaviest rain/snow just south of Minnesota Friday and Saturday, followed by chilly air next weekend. More nights below 32F and storms detouring south may help us avoid a worst-case flood scenario in April and May. MONDAY: Cool sunshine. Winds: NE 5-10. High: 44. MONDAY NIGHT: Clear and quiet. Winds: NNE 5. Low: 28. TUESDAY: Sunny and milder. Winds: S 10-15. High: 56. WEDNESDAY: Fading sunshine. Feeling feverish. Winds: SW 10-15. Wake-up: 43. High: 62. THURSDAY: Cloudy and cooler. Stray sprinkle? Winds: NW 7-12. Wake-up: 45. High: 52. FRIDAY: Light mix possible in far southern MN. Winds: N 7-12. Wake-up: 35. High: 42. SATURDAY: Mostly cloudy and cooler. Winds. N 10-20. Wake-up: 28. High: 40. SUNDAY: More sunshine. Feeling better. Winds: W 7-12. High: 45. 2007: Record warmth stretches from southern Minnesota to western Wisconsin with 72 at Owatonna, 77 at Menomonie, WI, and 80 at Eau Claire, WI. 1981: An F2 tornado hits Morrison county and does $25,000 worth of damage. "These next several mornings – March 26-29, 2019 – look for the waning moon passing by Jupiter and then Saturn in the early morning sky. You’ll look south from Earth’s Northern Hemisphere, and north from Earth’s Southern Hemisphere. If you do go outside and look before sunup, you can’t miss Jupiter and the moon. Jupiter, the king planet in our solar system, ranks as the 4th-brightest celestial object in all the heavens, after the sun, moon and planet Venus.outshines. It outshines Saturn by 13 times. Still, Saturn isn’t too shabby either, when it comes to brightness. It shines as brightly as a 1st-magnitude star, that is, as brightly as the brightest stars visible in Earth’s sky. You’ll also want to look for Saturn along the ecliptic, or path traveled by the sun and moon across our sky. Meanwhile, there’s also an even-brighter planet visible before sunup, too, not shown on the chart at top. Look at the chart and photo below, and watch for Venus in the east before sunup. Venus shines some 5 times more brightly than Jupiter and 65 times more brightly than Saturn." 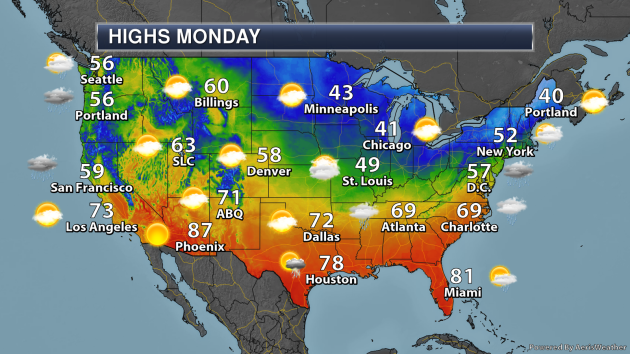 High temps across the country on Sunday will be a little cooler across the Upper Midwest with temps running nearly -5F to -10F below average. However, temps through the Intermountain West will be running nearly +10F above average. 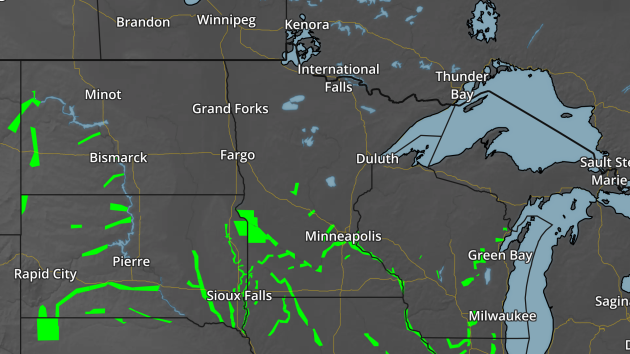 The weather outlook as we head into the last full week of March suggests somewhat active weather across parts of the Eastern US and Western US, but the Upper Midwest looks to be pretty quiet. According to NOAA's WPC, the 7 day precipitation forecast suggests areas of heavy precipitation across the northern half of California, while areas of the Central US could also see pockets of heavier precipitation as we head through the week ahead. "Climate change is taking a toll on the $20 billion winter sports industry — and swanky ski homes could lose value"
"Skiers in the western U.S. are enjoying one of the best seasons in years. But experts warn that years like this are quickly becoming the exception, not the rule. Snow sport seasons are getting shorter, due to warmer temperatures. That is already having a distinguishable financial impact on residential and resort properties that profit from snow. Vail Resorts, the largest player in the U.S. ski field, reported better-than-expected quarterly earnings in its latest report but had to lower its full-year guidance because of a weak start to the season. The company's CEO, Robert Katz, attributed that "to guest concerns after two prior years of poor pre-holiday conditions. "The amount of snow in the west has seen an average drop of 41 percent since the early 1980s, according to research just published in the journal Geophysical Research Letters. As a result, the snow season shrunk by 34 days." "THIS SPRING'S PREDICTED FLOOD RISKS: AN ESSENTIAL READING LIST"
"A report from NOAA warns that two-thirds of the lower 48 states are expected to face increased precipitation and flood risk through May. 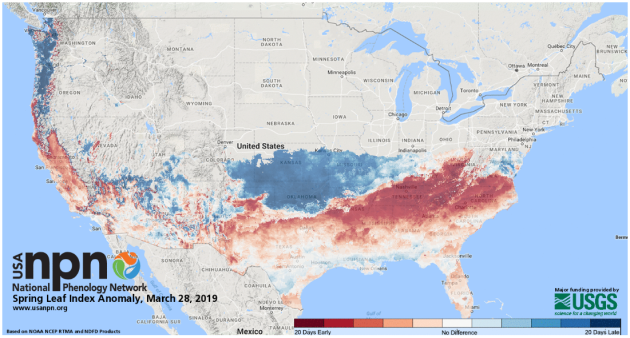 The National Oceanic and Atmospheric Administration issued its Spring Outlook on Thursday, warning that two-thirds of the lower 48 states are expected to face increased precipitation and flood risk through May. This report comes as some areas of the Midwest are already experiencing historic and catastrophic levels of flooding due to a combination of factors, including late season snowfall, heavy rain, rapid snowmelt, high soil moisture, and ice jams. In the upper Mississippi and Red River of the North basins, spring precipitation is already up to 200 percent higher than normal, NOAA says. In Nebraska, the state at the center of the floods, it will take years to rebuild lost infrastructure and restore the state's valuable soil, Earther reports. Additional spring rain will prolong these conditions, NOAA says, making flooding threats worse and more widespread." "Florence, Michael Retired As Hurricane Names"
"We won't have Florence and Michael​ to kick us around anymore. The now infamous hurricane names have been retired. MIAMI, FL — We won't have Florence and Michael to kick us around anymore. The National Hurricane Center in Miami announced that the now infamous hurricane names have been retired. But, it's not too soon to start bracing for Francine and Milton, which are the replacement names set to debut in the 2024 list of storm names. "Florence and Michael won't have another chance to wreak havoc in the Atlantic Basin," said officials at the National Hurricane Center in announcing the action by the World Meteorological Organization's Region IV Hurricane Committee of which NOAA is a member. Storm names are retired if they were so deadly or destructive that the future use of the name would be insensitive — otherwise names are reused on a six-year cycle. Last year Irma, Harvey, Maria and Nate were removed from the Atlantic list, according to NOAA. Florence and Michael were the only two this year." "Giant inland sea created by the disastrous Mozambique cyclone"
"Cyclone Idai left death, destruction, and a sprawling inland sea in its wake. The powerful tropical cyclone — which struck Mozambique last Thursday as the equivalent of a Category 2 or 3 hurricane with winds of around 100 mph — has left at least 150 dead and 600,000 in need of help in the flooded nation said the EU, though the Associated Press reports over 300 fatalities as of March 21 when accounting for deaths in neighboring Zimbabwe. The cyclone's widespread flooding — in part overshadowed by simultaneous and historic flooding in the Midwest — has left behind an inundated area some 200 square miles in size (518 square kilometers), with the inland sea reaching up to 15 miles wide, according to satellite images from the European Space Agency (ESA). " "Heat Waves, Heavy Rain, Flooding: Report Details Dangers of Climate Change in Great Lakes Region"
"From lake-effect snowstorms to cool summertime breezes, the presence of Lake Michigan is constantly felt by Chicagoans while confronting the city’s fluctuating weather conditions. The same goes for the 34 million people who live in the basin defined by the Great Lakes, which account for a fifth of the world’s supply of surface freshwater. Spanning 750 miles from west to east, the Great Lakes are always influencing weather throughout the region. In the summer, for example, their humidity offers cloud cover and precipitation both over the lakes and inland, providing ideal growing conditions for orchards in Michigan’s fruit belt. 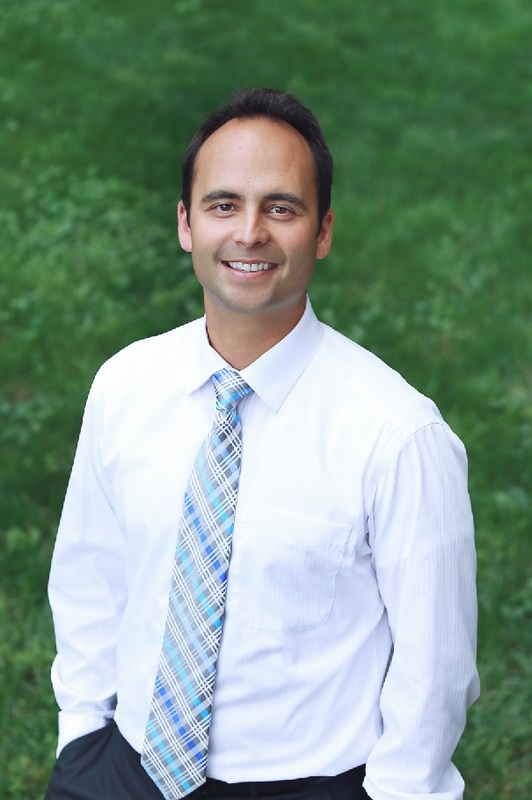 But a new, first-of-its-kind report shows how climate change is threatening the lakes themselves, and how their transformation figures to impact weather, public health, infrastructure, wildlife and the regional economy."